President Jim Brebner welcomed a turnout of 23 players on Sunday afternoon, for their Open 7 Ends competition. 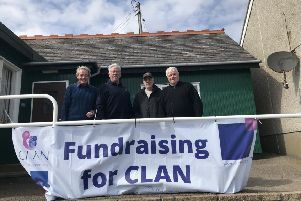 After some keen tussles in the preliminary rounds, the four semi-finalists were Sandy Jamieson from St Cyrus, and Fiona Anderson, Jim McCallum & Jim Brebner from the home club. After five ends of the match between Sandy and Fiona, the score was tied at 5 each, but Sandy took 3 shots over the last 2 ends to reach the final. In the other semi between Jim B & Jim M, Jim B managed to win 5 of the ends, and go through by 7-3. In the final, Sandy, who incidentally had won the earlier season Open 7 end competition , started off well by winning 3 shots at the first end, Jim however, took 7 shots over the next 3 ends, only for Sandy to come back and make the score 7-7 after the scheduled 7 ends. At the extra end, Jim managed to get the winning shot to lift the trophy. Johnshaven Bowling Club have completed three of their Club Competitions. Frank was again involved in the Nominated Gent Pairs competition playing with son Kevin against Roy Mowatt and Bill Webster It was a very close match, and Roy and Bill held a 2 shot advantage after 13 ends, but in the run up over the final 4 ends, managed to stretch their lead to run up winners by 9 shots. The third final was the Ladies 2 bowl pairs contested between Mary Brebner & Fiona Anderson against Fiona Dundas & Tracy Laing. Mary and Fiona A started off the better, with 5 shots at the first two ends, and although the remaining ends were a lot closer, Mary and Fiona A won by 6 shots. The Friday night hat nights, and traditional mars bar, has been won by Mary Brebner, Jim Brebner, Bill Webster, Shirley McKerron and Frank Laing (twice).